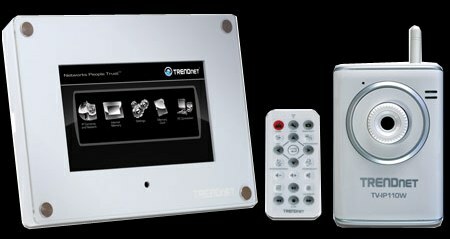 The award winning wired and wireless networking hardware global brand, TRENDnet has released its new 7-inch Wireless Internet Camera Monitor Kit (TV-M7110WK), which consists of a 7″ Wireless Internet Camera and Photo Monitor (TV-M7), and a Wireless Internet Camera Server (TV-IP110W) that able to provide high quality MJPEG video streams with up to 30 frames per second, aiming to provide real time security monitoring for sensitive areas. According to TRENDnet, the Wireless Internet Security Camera (TV-IP110W) streams crystal clear security video through a wireless router directly to the 7-inch Wireless Internet Camera and Photo Monitor (TV-M7), all without the need of a PC. The new TRENDnet 7″ Wireless Internet Camera Monitor Kit that comes with a 2-year limited warranty is available for about $450.